And now for the giveaway! Fill out the form below for a chance to win the limited edition Defining Eyes Palette by TiffanyD. This one-of-a-kind palette contains two gel eye liners, eight eye shadows, a dual-ended eye pencil plus a dual-ended brush. Bonus - it also comes with a booklet that features five of Tiffany's personal favorite techniques and tricks for creating looks! Note: One entry per person. International entries welcome. Winner will be announced on Dec. 17 and contacted via email. Love Sigma Giveaways!! WOO HOO!!! Good luck everyone!!! Is the giveaway only for affiliates? Good luck everyone but I hope I win!!! I fall in love with my E25 as well, perfect brush! I really would love to be able to purchase the Defining Eyes Palette, but can't. Such an awesome giveaway!!!! Gotta get me some. LOVE SIGMA COSMETICS. Wooow this is amazing! awesome give away!! Love it much. I tried using one of Sigma products and I really like it. Thanks! I hope I'm the winner... that could be the perfect Xmas present!! it's amazing!!! thanks for this giveaway!!! Thank you for the Awesome giveaway. Good luck everyone!!! I want to so much this palette... If I won I'd be the happiest person in the world. I love this palette is a basic! Don't own a single thing from sigma, but heard great things! Thanks Sigma for another Great Giveaway!! 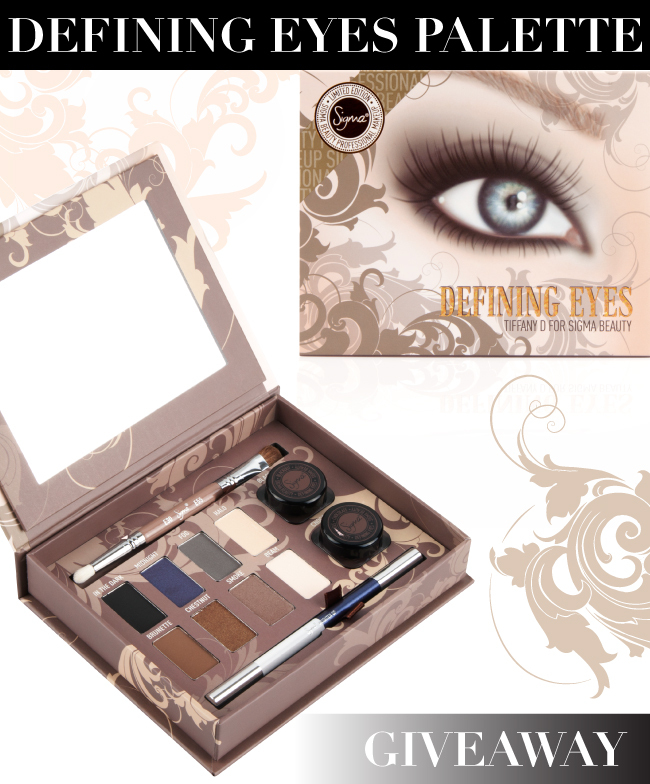 Amazing palette, everything you need to create flawless eyes in so many different ways. No wonder, Tiffany is always best at everything :-) . This giveaway is awesome. I adore Tiffany. Thank you for doing a giveaway! Hopefully I win and It would be awesome try the Sigma Beauty Products Never tried them before :( Crossing my fingers to Win!! I hope to win this! Great giveaway! i am deep in love with SIGMA products!!!! nice giveaway! THANK SO MUCH SIGMA FOR THIS CHANCE!!!!!! I LOVE YOU!!! Ps: I'm so anxious waiting to receive some products that i bought last Black Friday!!!! I want to have it now in my hands!!!! I leave my comment yesterday!! !I dream about the looks that i wish create!!! I hope to win so so much!!!!! Thank u SIGMA!! !You are the best!!!!!! Good luck to everyone! But I really hope I win. This would be such a cool early birthday present(Chrismas Eve). The palette looks really nice. It would be great to have it.